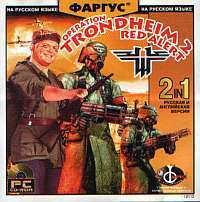 This is the second in a trilogy of pirate Russian-made add-ons combined with the original game Return To Castle Wolfenstein that were intially released as a retail products but have been allowed to be downloaded as separate mods. Take part in the legendary events in the port of Trondheim - this time on the side of the Soviet Union! You are a Russian spy and your mission is to steal the Wehrmacht encryption codes, which are so necessary for the Stalinist command. At the port comes British troops, and if the necessary documents fall into the hands of the British it will mean the failure of the mission, and you will be an "enemy of the people." Remember - the information you need to obtain at no expense. It has 10 brand new maps, hundreds of Nazis, and a cynical view by the game developers on the lives of Soviet soldiers.